The unsurpassed genius of realism and thematic plot paintings Vladimir Egorovich Makovsky in 1875 finished work on the canvas “Waiting at the fortress.” The idea of ​​the picture was inspired by the revolutionary moods dominant in the country. Many people for their thoughts on the policies of the current government went to hard labor. Their families followed them: women, children, old people. 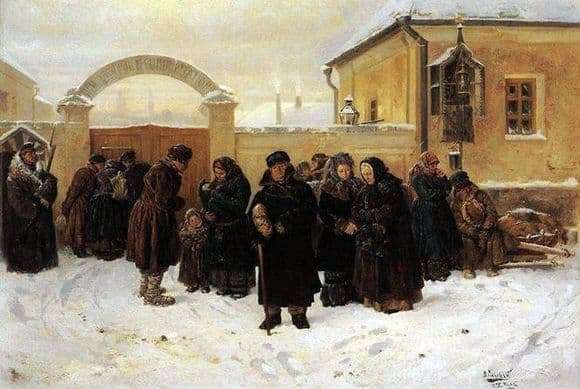 Vladimir Makovsky, as a man who is acutely sensitive to all the pain and grief of the Russian common people, did not stand aside these sad events. “Waiting at the prison” depicts a lot of people. They are all of different ages, but their common goal unites. Each of those present awaits the release of native people who are sent to a link to the Siberian lands. Their faces are full of grief and sorrow. Poses speak about a serious moral condition. Shoulders lowered, arms crossed. All this happens against the backdrop of a dull winter landscape. In the background is the house where the unfortunates are kept. The color palette is chosen very restrained, there are no bright blotches. The brilliant painter who had spent many years contemplating the grief of the Russian people was an extremely sympathetic person. All his works are based on these emotions.